Oh Dior…you really are rocking my boat en ce moment. A saunter around the Spring Press Day had the make-up slaves amongst us longing for these new releases. Not only have you indulged my perfume addiction with the release of the gorgeous Collection Privee by Perfume Creator, Francois Demachy (see former post HERE) but you have added to it with the most subtly gorgeous of perfumes that’s more laid back than the adorable husky in-your-face chutzpah of Mitzah but with the roundedness of the baroque, amber tones of Ambre Nuit: Enter stage left, the silky Patchouli Imperial. But more of this sultry minx in another post devoted entirely to her. After all, she isn’t released until 23rd January 2012. As with the Collection Privee (available at Maison de Parfums, Selfridges), Spring 12’s make-up releases from the most famous of fashion houses takes Christian Dior’s homes, his love of Granville and his various flower gardens there and at Milly-la-Forêt as inspiration and translates these into the most divine collection of covetable colours and trinkets for women with taste. 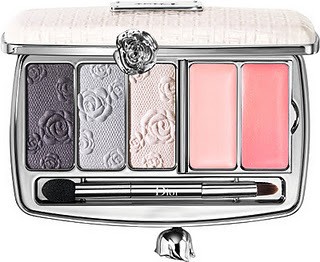 The Dior Garden Clutch winked at me and made me want. It’s pale pink shell casing has a rose shaped, ladylike, clasp which opens to reveal either tones in Milly Garden (as seen above in pink, silvery-blue & violet tinged grey) or Granville Garden (pink, pale green & deep brown). 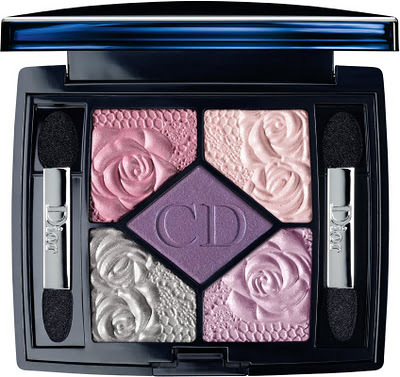 The 5 Couleurs palettes has been re-invented as a Collectors Edition with roses strewn across the surface in two colour combinations – Garden Pastel or Garden Roses. So beautiful, its almost a travesty to smudge the roses. The Rosy Glow blush charmed me with its bright pink cheeriness and its magic touch – to intuitvely adjust to the moisture level of each skin type to give a fresh look that complements the wearer’s skintone. Dior’s Nail colour selection has become something of a cult. 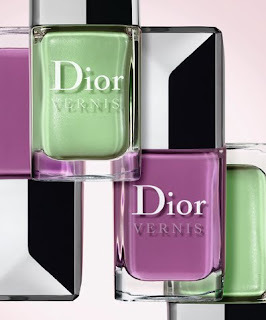 This season, the recognisable square Dior bottle is filled with either Waterlily, a soft sheeny green or Forget-Me-Not, a floral mauve. And, both new colours are scented with rose which is very noticeable even after a day’s wear. And there’s skincare, too. SkinFlash and Skinflash Primer look set to be the newest wonder product with their ingenious pigments that diffuse light as well as containing minerals and hyaluronic acid that chase away signs of fatigue. And back to my first love – perfume. Not only did I go ga-ga over Patchoulli Imperial, but we have the up and coming re-release of Diorling to look forward to and boy, is she a beauty. She was, after all, a sign (in 1962) of the renaissance taking place at the House of Dior under Marc Bohan. A sophisticated chypre, she’s vivacious as well as uplifting and a welcome characterful addition to the Dior range. Like the couture and the ready-to-wear collections, Dior’s strength in its beauty and perfume ranges is in managing to leap forward to what women want while keeping the strict ethos of Dior’s house style and personality. Who’s looking forward to Spring already? All make-up products available from 2nd January 2012 from Selfridges and from 16th January, nationwide. Previous post: Damaris ‘Packs Heat’ with Liberty Ross short film. Next post: G-Star RAW Hosts Women’s Night at Covent Garden Store (27th Oct).